Hundreds of federally-contracted low-wage workers, mobilized by the new labor coalition Good Jobs Nation, are joining together in a call for decent living wages and speaking out against alleged pay theft by federal contractors. The movement is calling on President Obama to sign an executive order or legislation requiring higher wages for employees of federal contractors. A report published by Demos found that the federal government subsidizes over half a million jobs that pay less than $12 per hour. When spending on Medicare, infrastructure and other costs are included, the government subsidizes nearly two million such jobs – more than Wal-Mart and McDonalds combined. Food workers at the Ronald Reagan Building and International Trade Center in Washington, DC, are the most recent to protest the unjust pay. They claim a total of eight franchises at the federal building have paid employees less than the minimum wage and ignored overtime pay laws. Joanne Kenon, an employee at the National Zoo in Washington, DC, says she is struggling to make ends meet on her $8.50 an hour wage. 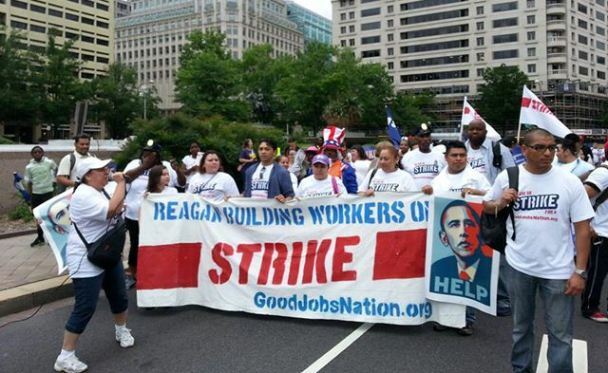 The strikers are asking supporters to click here to tell President Obama to use his executive powers to require all federal contractors pay a living wage and respect workers’ rights.